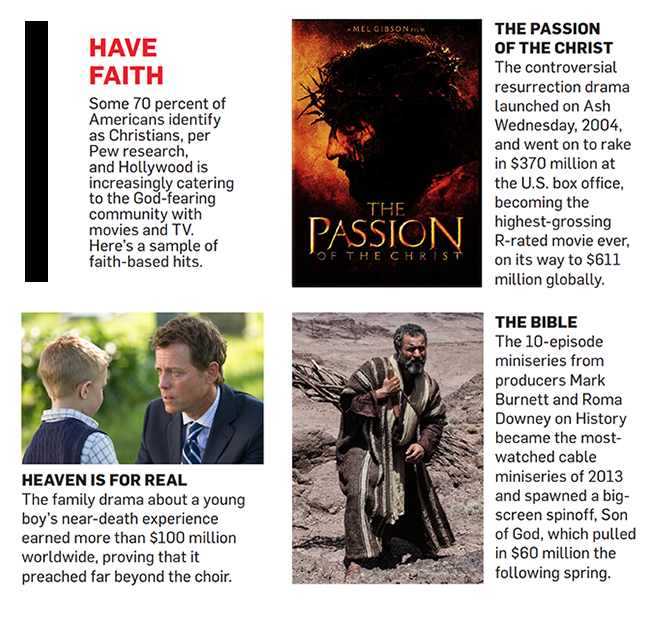 Hollywood, sometimes considered the last place to find anything divine, has seen the light lately, releasing a flood of faith-infused entertainment that includes TriStar's Heaven Is for Real, Focus Features' The Young Messiah and a live musical version of The Passion on Fox (which aired on Sunday, March 20). And just in time for Easter, the uplifting family drama, Miracles From Heaven, starring Jennifer Garner and Queen Latifah, is expected to hold its own against the big-budget dystopian thriller The Divergent Series: Allegiant. 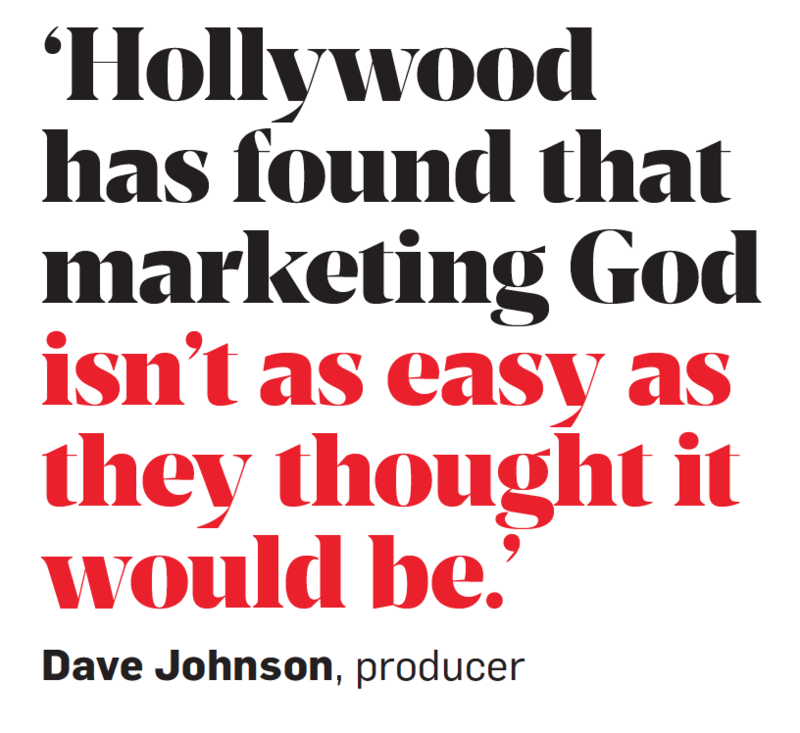 "Hollywood is churning out faith content with a pace and frequency that has not been seen in a generation," said Chris Stone, founder of advocacy and marketing group Faith Driven Consumer. "There's been a real effort to improve the quality, and we've gone from $2 million movies to $20 million movies aimed at the faith crowd." Among the recent hits: Sony's resurrection story Risen has pulled in a respectable $32 million since its February release, and last fall's paean to prayer, War Room, nearly dethroned Straight Outta Compton for the top box office spot, opening at $11 million on one-third as many screens as the N.W.A. biopic. It eventually made $67 million. God's Not Dead 2, a sequel to the $60 million-grossing original about religious freedom, launches April 1. One of the most anticipated films of the year, Paramount and MGM's remake of the iconic swords-and-sandals epic Ben-Hur premieres in August, the same weekend that Lionsgate opens The Shack, based on a best-selling Christian novel. Marketing for values-centric projects, often aimed squarely at the country's churchgoers, has added sophisticated microtargeting and extensive social media to its arsenal, going "direct to pew" to tap into a traditionally underserved audience, Stone said. Grassroots tactics still lead the way, with studios and for-hire Christian outreach firms setting up church screenings and group ticket sales, gathering pastors and Bible study groups for early endorsements and producing educational and sermon-ready materials. In essence, everyone's using the playbook written during the massive on-the-ground campaign a decade ago for Mel Gibson's The Passion of the Christ, the most successful faith-based film in history. That approach is often still effective, but there are digital-age updates. Tyler Perry, host and narrator of Fox's The Passion, spent months mobilizing his fans across Twitter and Facebook for the live musical set in New Orleans with Seal, Chris Daughtry, Trisha Yearwood and Jencarlos Canela among the cast. The glut of spiritual content may be good news, but it's also causing influencer burnout, and many ministers have been unhappy with product touted as the gospel truth. Paramount's adaptation of Noah, with Russell Crowe, snagged $360 million globally but earned only thumbs-down ratings from Christian groups for its departures from the Old Testament. There have been other misses. Fox's Exodus: Gods and Kings fell flat with believers and the general public, and ABC's much-hyped miniseries Of Kings and Prophets recently drew some of the worst viewer numbers of any network series premiere this season, along with flak from the Parents Television Council about its kid-unfriendly violence. ABC canceled the show last week. Stone and other media watchers say that taking liberties with scripture is a sure path to failure with this audience. "Consumers have become more discerning, and they won't just support anything that's touted as faith-and-family values," said Dave Johnson, a writer-director-producer who helps market projects like Hallmark's Christmas With Tucker, indie feature October Baby and others on his roster. "You have to be authentic, and you have to get through the suspicion. 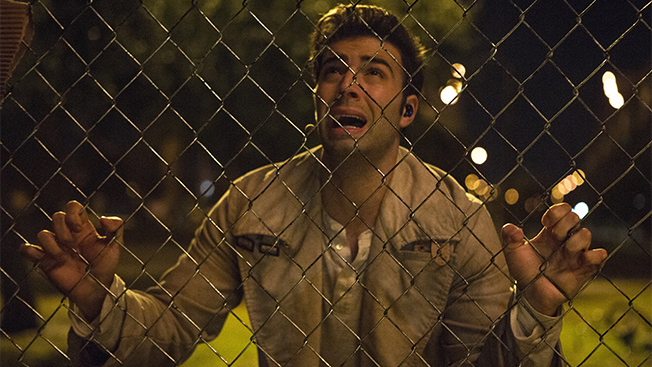 Hollywood has found that marketing God isn't as easy as they thought it would be."